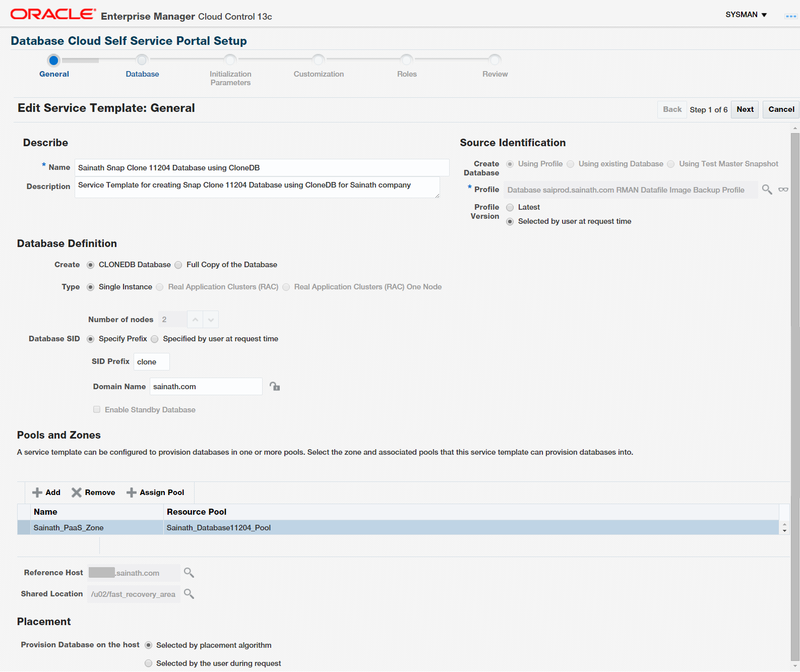 In this article series, we have been exploring the capabilities of Oracle Enterprise Manager Cloud Control 13c for the private Database-as-a-Service (DBaaS) cloud – including the setup of such a cloud. In the previous parts, we started the setup of the private DBaaS cloud, including the configuration of the self-service portal. The full procedure includes setting up the Enterprise Manager software library, creating the PaaS infrastructure zones, database pools, and quotas for the users, service templates, and optionally chargeback plans to apply to the users for cloud allocation and cloud usage. Note that Database Cloud Requests can fail for certain reasons, such as placement logic failures. Placement logic uses a seven-day average for memory and CPU constraints when locating a suitable database server within the selected PaaS infrastructure zone where the new database can be created. It is important to configure the FRA and enable archiving, if you want SSA users to schedule database backups and perform restores by themselves. This puts the onus of power right in the hands of the SSA user, and they need to use this power responsibly and wisely for the sake of their own databases. 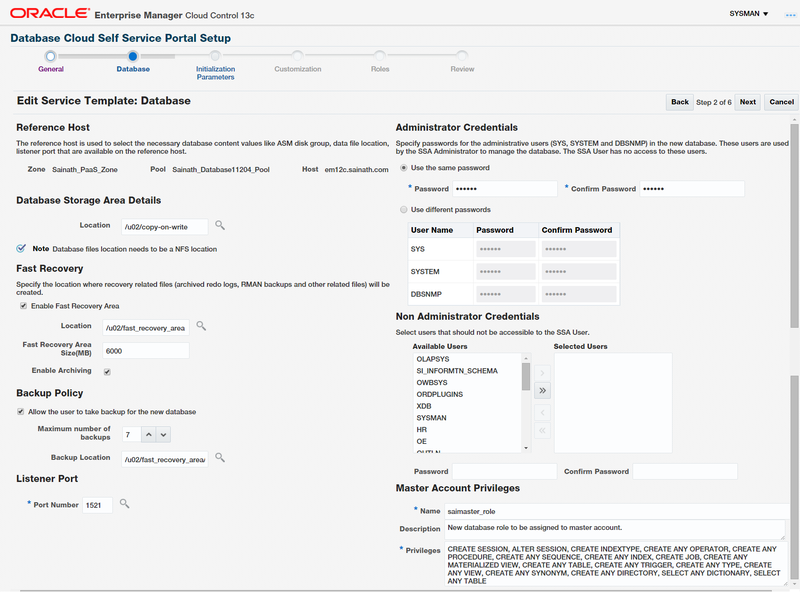 On the same page, enter the passwords you want to use for the administrative users (SYS, SYSTEM and DBSNMP) in a self-service created database. Note that as the SSA administrator, you are currently creating the service catalog entry for the database, and once the SSA user has created a database using your service catalog, you can then use these logins can to manage the database. The SSA user will have no access to these passwords. Since this is a demo system, we select “Use the same password”, otherwise we would use different passwords for a production or test system. Click on Next. The Initialization Parameters page appears. On the Initialization parameters page, simply select the “Database Sizes” that the service template will support. These are the pre-created sizes we had created in an earlier section in this article series. The limits for each size are also displayed. You can choose to include all of the sizes or only some of them in each template. This gives the SSA user SAI_DAS an option as to which database size to select. Click on “Set as Default” to make one of the database sizes the default, so that it is the first choice for the SSA user when this service template is selected at the time of self-service database creation. Click on Next. The Customization page appears. On this page, you can specify the custom scripts to be executed before and after creating the service instance. A Post SQL script can also be specified. In addition, custom scripts to be executed before and after deleting the service instance can be specified. All these are optional, of course. Target properties for the new self-service database can be specified as well on this page, such as the administrative contact, the downtime contact, the lifecycle status, the line of business and so on. Click on Next. In the Roles page that appears, you can add the role SAINATH_SSA_USER_ROLE to the template. This means the users assigned this role, such as SAI_DAS, will have access to this template in the self-service console, and will be able to create a new database. Go to the next page, review the service template and create it. The new template now appears in the Database Service Templates list (Setup | Cloud | Database | Service Templates). We will now create a new service template to provision a snap clone database. This will use CloneDB technology on a dNFS copy-on-write file system. On the Database Service Templates page, click on Create. The first page of the wizard is seen in Figure 28. Name the new template as “Sainath Snap Clone 11204 Database using CloneDB”. From the list of profiles, select the appropriate profile “Database saiprod.sainath.com RMAN Datafile Image Backup Profile” that was created with an RMAN Database Image. As the Profile Version, choose “Selected by user at request time”. This will allow the SSA user to select any of the available RMAN backups that have been created by refreshing the profile. In our case, there is only one datafile image backup so as to conserve resources. Due to the fact that a “Datafile Image Backup” has been created as the profile, an option appears dynamically on the page to create a CLONEDB database. Select “CLONEDB database” and not “Full Copy of the Database”. Put the SID prefix as “clone” (you can use any SID prefix as per company standards) and the domain name as “sainath.com”. Add the Sainath_PaaS_Zone and assign to the Sainath_Database11204_Pool. The other options on this page are similar to what we have seen before. Click on Next. The Database Details page appears (Figure 29). On this page, a note is displayed under the Database Storage Area Details: “Database files location needs to be a NFS location”. So we select an NFS location “/u02/copy-on-write” as the database storage area; this location has been set up previously as an NFS share at the Unix level on this database server – the instructions on how to do this are in the My Oracle Support (MOS) Document “Configure Direct NFS Client (DNFS) on Linux (11g)” (Doc ID 762374.1). Enable the Fast Recovery area. You need to select a file system location such as “/u02/fast_recovery_area” for the fast recovery area. ASM cannot be selected in this case due to snap clone requirements for CloneDB. Select the Fast Recovery Size as 6000 MB. Also enable Archiving for the new database. Allow the SSA user to take up to 7 (maximum 10) backups for the new database. As the backup location, specify “/u02/fast_recovery_area/clonebackups”. Note – the backup does not use copy on write technology, so it is not a space saver if multiple backups are performed by the SSA user. So in this case you do not need to use an NFS location for the backup location in the service template. For the Listener port, enter the port number that should be associated with the new database, or the scan listener port number if you are using 11.2 RAC and above. Name the Master Account role as “saimaster_role” and add the “select any table” privilege to the role in addition to the existing privileges shown. This can be done if the requirement is that the master account role should be able to select any data from any table in the database. On the next page, which is the Initialization parameters page, select the “Database Sizes” that the template will support. This gives the SSA user SAI_DAS an option as to which database size to select. Set the Small Database size as the Default. Any such “Database size” selected by the SSA user will override the corresponding initialization parameters such as sga_target, pga_aggregate_target, processes and cpu_count parameters. The Storage GB, as we mentioned before, is not a hard limit on the database but only used for thresholds and alerts. Move to the next page, there are no custom scripts to add. Click on Next. On the Roles page, add the role SAINATH_SSA_USER_ROLE to the template. After this, review the service template and click on “Create” on the review screen to save the template. The new template now appears in the list of service templates (Figure 30). Next, Click on Request Settings in the left panel. Figure 31 is displayed. On the Request Settings page, the SSA administrator can choose the “Global Settings for Database”, that will be enforced for all the SSA user requests for new databases. “Future Reservations” – how far in advance a user can make a request – can be restricted to a certain number of days in advance, or there can be no restrictions at all. Likewise, the requests can be set to have a restricted “Request Duration” in days, or no restrictions. You can also set the archive retention to the maximum duration after which archived requests will be automatically deleted by the system. 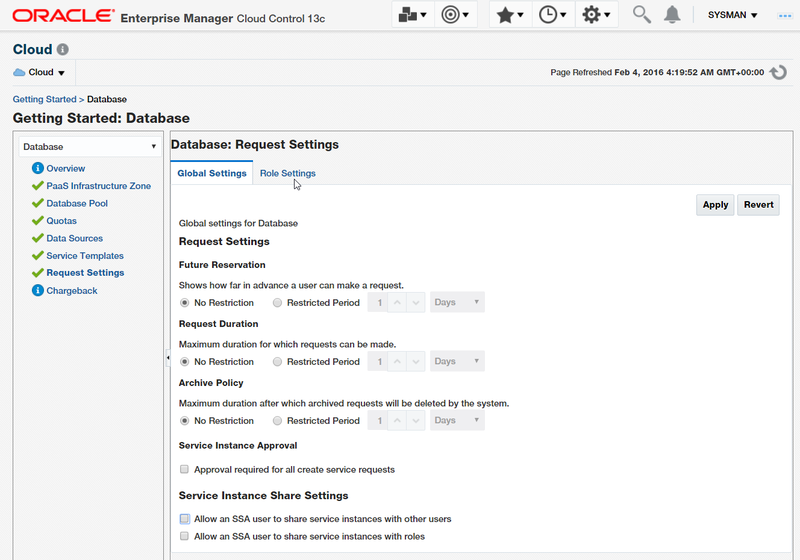 Enterprise Manager Cloud Control 13c has introduced new request settings on this page. For the first time in Enterprise Manager, there is a “Service Instance Approval” setting. If this is set, then approval is required from the SSA administrator for ALL create service requests requested by the SSA user on the database side. You can also set the “Service Instance Share Settings”, whereby you either allow an SSA user to share service instances with other users, or alternatively share the service instances with roles. This way, if one SSA user creates a database instance via self-service, then either other specified SSA users or all SSA users assigned a specified role will be able to see the new database instance in their own self-service console. They will be able to share the monitoring and management. For example, a development team can use this kind of setup. Move to the Role Settings tab. This is seen in Figure 32. In this tab, you can specify different database request-related role settings for different roles. Simply click on “Create”, select the appropriate role, and change the settings for that role. Here we see that the SAINATH_SSA_USER_ROLE has been added, and “Request Approval” has been enabled for this role. This means that whenever the SSA user SAI_DAS requests a database, the SSA administrator will need to approve the request. Once approved, it will be automatically actioned. So perhaps you could have a special role for certain requestors who want large production databases, so that special approval is required before the request is actioned. It would have been better of course, if the request approval requirement could have been set at the individual service request level. In this way, you could specify that certain service requests require approval, such as large production databases, or every production database. But at this point i time, it is not possible to set approval requirements at the service request level. This concludes the article series. We hope you have enjoyed learning about Oracle Enterprise Manager and Database as a Service. Thanks for your readership.